What a crazy week! between battling a weird stomach flu, the stress of work, and getting things settled before I go on Vacation (Yay!) it has really been non stop for me. I say this as a good thing though I truly love being busy. I just feel so fulfilled when I know my calendar is packed with awesome fun things to do. With that being said I’m so excited to announce I have been given an amazing opportunity! want to know what it is? of course you do! 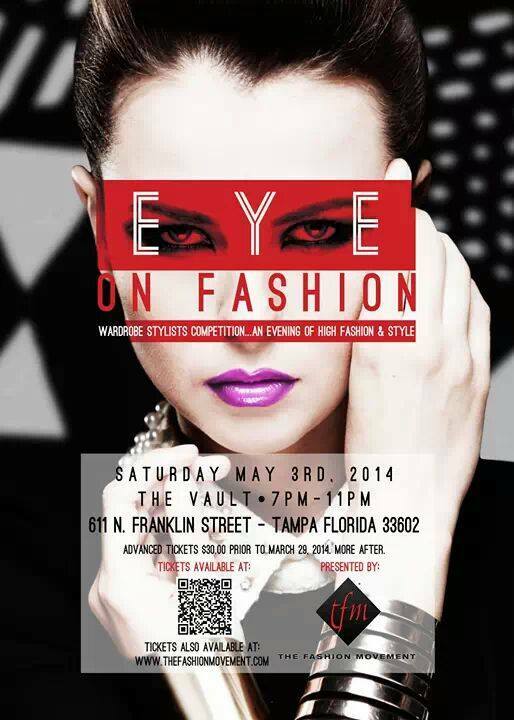 I have been given an exclusive invitation to cover a great event called Eye on Fashion. Here is some info! The “Eye on Fashion” competition will feature the works of fashion stylists Faheemah Safa (New York), Melizza Williams (Florida), Ify by Bobi (Virginia) and Tristan Richards (Florida). This unique event gives the participants an opportunity to showcase their talents and skills to prove who really has an “Eye on Fashion”. The popularity of Rachel Zoe and June Ambrose has grown over the last few years. Fashion stylists are a staple for not only the industry, but the everyday fashion lover or professional. This is the event for them to showcase their talents,” said Lacey B. Smith, Chief Executive Producer/Founder of The Fashion Movement. Each stylist will present five distinct looks. The first place winner will receive a $550.00 cash prize, an award, plus a full spread layout of their styling work in Revized Magazine. The last Eye on Fashion competition in 2012, named Amandia Reese-Craig of Artistyles Boutique as the winner. I’m really looking forward to seeing who this year’s judges will crown as the winner,” Smith added. Attendees can enjoy live musical performances, photo displays and designer collection previews. Exhibit booths will also be available from 7pm to 11pm and complimentary sampling of food and drinks. Tickets are available at http://www.thefashionmovement.com. Don’t miss one of the most talked about fashion events of this year. I truly feel so lucky that I have been given this amazing opportunity! I cant wait to represent myself and chickicouture with the up most professionalism. I can’t wait to meet all the stylist and get all the inside scoop on this event! Be on the look out for another post including full coverage with pictures and behind the scenes access.